On Tuesday, I began a week-long promotion with the goal of moving “Time Is Irreverent” to #1 on Amazon in at least one US category. Yesterday turned out to be my best sales day ever, and my novel is currently at #2 in LGBT Science Fiction, #5 in Humorous Science Fiction, and #6 in Dark Comedy. The US Amazon charts are much more difficult to climb than the Canadian charts (where I’ve already hit #1 in six categories), because all the top books sell impressive numbers day-after-day. 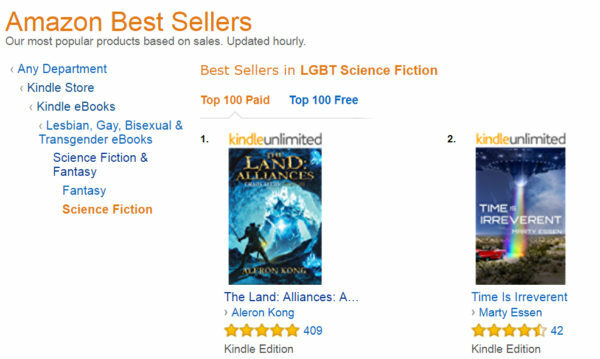 I have a chance of hitting #1 in LGBT Science Fiction today, but the book ahead of mine is part of a very successful series. I will have to beat yesterday’s sales record and then some to reach my goal. Maneuvering up the Amazon charts has become a sport!